The 15th of September 2001 is the day 11 year old gelding Spooky Mulder broke his maiden at first asking at Turfway in a 30K maiden claimer. 8 years, 81 races and 33 wins later he is still racing. He is entered at Belmont on Saturday for a 35K tag as a main track only in a 6 furlong turf sprint. He is an amazing gelding and I don't think I know of a horse that has given so much for so long at the track. For the last few years I see a pattern developing in the media around derby time that a breakdown story or a disaster newsreel(warning explicit content) is shown on TV around the time of the derby. This year is no exception. With the same message being repeatedly broadcast and printed the public is being indoctrinated to equate racing with cruelty. I notice that when I bring up racing at mainstream non-racing message boards the same response of racing is cruelty is mentioned time after time. The response is very consistent. Back at the school yard another consistent reaction was for a crowd to form around a fist flight. What kind of crowd would a kind gesture draw? It would barely turn a head. This is human nature in action and it seems like the media using the dark side of racing to draw a crowd the same way a fight would draw a crowd. The media is exploiting breakdowns for the horror factor. There is an audience for this. Go on youtube, perhaps the most famous of races the 1973 Belmont Stakes has 265K views while a video labeled Eight Belles euthanzied has 842K views. If it bleeds it leads, the media has found that there is bleeding in racing and has found that there is a audience for this type of content. These breakdown videos are almost like the sports equivalent of "when animals go wrong" or "worlds wildest police chases". Like a schoolyard fistfight they draw a big crowd. The responses and comments on the on-line articles are predicable. The most common response is; "This "sport" is nothing more then rich people, with nothing better to do, abusing horses. ". These people making these cursory judgments are not bad people, maybe under-informed but their reaction is nothing more than a function of human nature. It is an easy response to understand. I have that animal-abuse-outrage button too, and it gets pressed rather easily. If I hear a story about an animal being abused or dying in a cruel way it outrages me like nothing else. For many people all they know about racing is from these tragic incidents reported in the media. Between tragic incident stories there is a void of no information at all. From their point of view they feel compassion for the animals, and we can all understand that. To hate the people that abuse animals makes you feel good about yourself. There is noting redeeming or virtuous in animal abuse. Animal abuse represents the worst for human behavior and is often an indicator of a person with diabolical tendencies. The thought of the racing community running horses to death outrages people. In the vacuum of information someone that has never enjoyed horse racing could easily be swayed into believing that racing is pure animal abuse. This is why it is of the utmost importance that racing does everything it can to promote the positive things that people in the horse racing community do. The stream of negative stories must be balanced with positive stories. The kind care that the horses receive and the tireless effort of people that do right by their horses must be highlighted as the false perception that racing is abuse grows. Manteca has been freshened down in Florida and has moved to the Pletcher barn. This is a talented colt and he is the mostly likely winner today. The wagering favorite will be #3 Wishful Tomcat who had a unsuccessful campaign in California and at the Fairgrounds. Manteca should stalk Wishful Tomcat and be able to pass at the top of the lane. The others in the race are outclassed. Mr. Fantasy did his late brother proud by winning his first graded stakes in the Withers. My associate in the paddock reported that Mr. Fantasy was a perfect gentleman in the Aqueduct paddock. This improved behavior translated into a nice score and rebound after his Gotham hysterics and fade. The suggestion to point to the Withers worked out well. Moving forward Terry Finley has expressed that there are two options on the table for the colt, the Preakness or the Met Mile. Time wise and behavior wise the Met Mile makes more sense for three reasons. For one this high strung colt could react poorly to shipping, the prestigious Met Mile is right at home. The Preakness paddock is sure to be a wild scene where a high strung colt like Mr. Fantasy could be set off. The second advantage is the distance as Mr. Fantasy is building a resume at 1 mile but is still a question at 9.5 furlongs. The third factor is the competition, while the Met Mile will surely draw a strong field, the three year old colts this year have been exceptional, Mr. Fantasy may have an easier time of it in the Met Mile while enjoying a significant weight break. I look forward to seeing Mr. Fantasy on Memorial day. Until the restoration of regular train service to Belmont Park, which was eliminated as part of a series of budget cuts and proposed fare hikes by the MTA, the shuttles will operate daily except for June 6, Belmont Stakes Day, and Saturday, May 30. 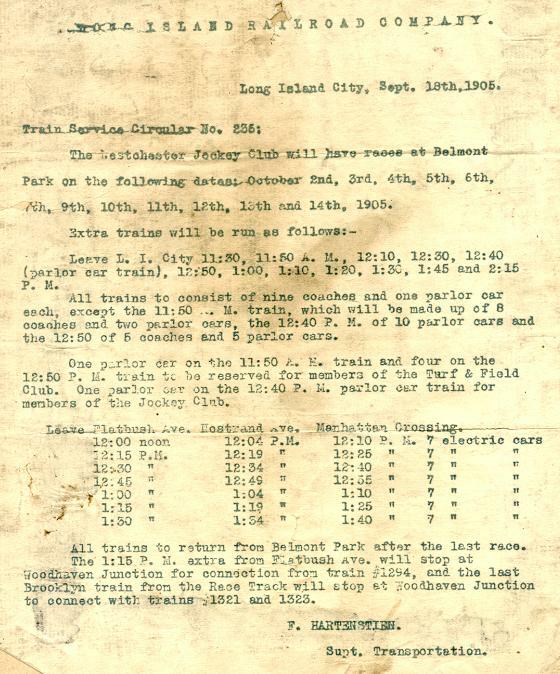 On those days, passengers can board the LIRR Belmont Park Special at Penn Station, Woodside or Jamaica. Home of the $1 million Belmont Stakes, Belmont Park’s 64-day spring/summer meet runs through Sunday, July 26. As the MTA opens the new $91 million Yankee Stadium station they look to shutter 104 year old Belmont Park Station next week. The information from the MTA is conflicting regarding the service elimination at Belmont. The MTA website schedule still lists a train departing Penn Station at 1156am on Wednesday 29APR with the destination of Belmont park. The changes section of the MTA website lists the Service cuts at Belmont effective early September. Then a call to the LIRR yielded the information that the train to Belmont will only operate on Satuirday 30 May and 06Jun for the Belmont Stakes. Dealing with these bureaucrats and their inefficiencies is very frustrating, so it is hard to confirm anything regarding the train service to Belmont Park next week. With the news surfacing that Quality Road has another quarter crack his status for the Derby has to be downgraded to doubtful or maybe questionable. Surely James Jerkens will do the right thing by the horse, if Quality Road is not 100% he should stay in New York and point to a summer campaign. With Quality Road out the pace is going to be even more tepid. This really moves up a few horses who figure to benefit from a moderate pace. Papa Clem stands to benefit along with Regal Ransom and I Want Revenge. Will Pioneer Of The Nile transfer is excellent form to dirt? This is a big question that every handicapper betting on the derby must consider. According to the latest article in the DRF Pioneer Of The Nile's first workout was first-rate. He handled the track and glided over the surface and was tabbed going six furlongs in 113 and 2/5ths. Recent Hall Of Fame inductee Baffert was convinced that making the switch from synthetics to dirt would not be an issue for Pioneer of the Nile. Another part of the equation is the dirt kickback during a race. This is something that Pioneer Of The Nile has yet to experience. We have ten days to commit to either answer of this question or the prudent move may be to hedge and play both sides. I'm still pondering. Never felt so good about getting nosed out for the superfecta. Are Synthetic Surfaces Weeding Out The Derby Speed? Many times the Kentucky Derby has been what I call a "chaos race". Start with a large field then add in an abundance of speed horses and need the lead colts with no hope whatsoever and you have something hot and sultry breaking out on the lead. These heated speed duels on the lead neutralize the quality speed horses, and set the race up for deep closers. Monarchos is a great example and well as Giacomo in 2005. This year is setting up to be a walk in the park on the lead. Looking at the top 20 graded earning list it seems the preponderance of synthetic prep races have stopped the cheap speed horses before they crossed the velvet ropes into the entry box. Almost every horse to emerge from the Kentucky or California preps are devoid of speed. Those lucky enough to prep and possess speed have a marked advantage over their synthetic raced competition. We can bemoan the effect of synthetic surfaces on racing or we can accept it and profit from it. Smart money chooses to accept the present. In past years California and Keeneland produced very fast colts for the derby, this is not the case this year. There is no Sinister Minister or Brancusi to overheat a speed duel. This year the California preps have yielded a graduating class permeated by closers or horses with a turf pedigree. Pioneer Of The Nile, the leading candidate from California was judged a turf horse by his former conditioner Bill Mott. Mott started this colt on the turf and he had a successful two year old campaign over the weeds. For his three year old campaign he was sent to Baffert specifically to take advantage of the synthetic surface at Santa Anita. Now in the biggest race of the year the Empire Maker colt has to cede all advantage and try something that he was deemed not to be his forte. While he and the dozen or so like him are spinning their wheels on the foreign surface they are going to have to deal with dirt kickback. Add in a tactical disadvantage we have a stacked deck against the synthetic derby prep graduates. The Derby may have produced a "who's who" of Chefs De Race but this years Kentucky based preps (Lanes End, Bluegrass, Lex) have a produced a "who the heck is that" list of Derby candidates. These races over the polytrack at Turfway and Keeneland have produced confounding longshot victories and every colt considered for the Derby out of these races is devoid of speed. The perfect scenario for a wire to wire victory in the Kentucky derby is building. The horses that stand to benefit are Quality Road, Papa Clem, Friesian Fire and I Want Revenge. This becomes a case of the rich get richer as all four have class and speed. Now they have a tactical advantage as well. All four horses have shown speed along with a rating gear which should further ice any possible speed duel. The only need the lead type even being considered is Todd Pletcher's Join In The Dance. Quality Road who figures to be the speed of the speed may just benefit the most from the likely pace scenario. Quality Road was very impressive winning the Fountain Of Youth. In the FOY Quality Road outlasted three other quality speed sprinters and drew off to win for fun. On paper the FOY was a speed chaos race. Then Quality Road stretched out and turned back the highly touted and heavily bet Dunkirk in the Florida Derby after being passed at the top of the lane, showing class and gameness. All indicaters except that quarter crack are pointing to Quality Road. Whenever some pundit suggests that government intervention can heal the economy or some other massive issue I shake my head and wish these people would get out in the real world and see the daily gross incompetence displayed by government. A great example is the Aqueduct VLT(slot machine) parlor that was approved in 2001 that has yet to be opened. If government can not get a minor project right it is doubtful they can succeed and more ambitious projects like the economy or food hygiene. This project was first approved way back when Monarchos won the Derby, Monarchos now has 6 year old horses racing. The first approval was for MGM Grand to run the slots. Construction actually began in 2002 and the slots were slated to start operations in 2003. Then Pataki came in and shut it down. 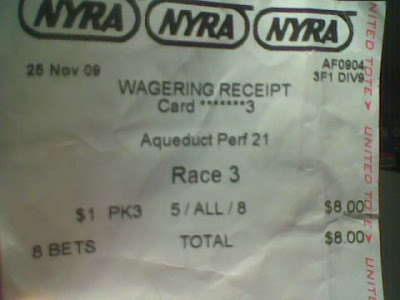 NYRA needed to prove that it had integrity. This opened up slot grab number two which led into the NYRA scandal period of 2002-2006. Everything from waiters taking tips for primo tables at the Spa to mutuel clerks pocketing till money became a big story in the press. NYRA was bad and someone needed to step in to take over the corrupt racetrack. There might have been some truth the the hype but it was mostly concocted to make the slot hopefuls feel that there was a tremendous opportunity looming to open a casino within the borders of New York City. The bidders smelled NYRA's blood in the water when front page jockey weight scandal headlines loaded the slot waters with scandal chum. This fueled the slots feeding frenzy with multiple rounds of bidding for the slots. The politicians had a field day as slot grab bidding frenzy was launched every year enabling those in charge to reap the booty of potential operators lining up to get the slots license. Pataki played the field. There was Bruno who secured Magna as a client and turned from an ardent NYRA supporter to a NYRA detractor on a dime. Clint Number Nines primary suitor was R. Fields reality who provided air power during his election bid for governor. Now it is Sheldon Silver's turn to get sloppy seconds. The cash grab might not be as lucrative this time around but you have to love the chutzpah displayed by Silver launching the Aqueduct slots cash grab for the forth time. The first round was for Pataki, the second round for Bruno, the third was Client number Nines payday now it is Silvers turn to score with another round of kickbacks, free airplane rides, and free dinners as the suitors like up to secure the slot contract. Could they go for round five early next year? Whose turn is it next? Or did they go to the well too many times? Either way as long as Silver and the other connected ones secure their booty who cares about the people or racing. Mutakaway is going to steal away here to another win. She holds pace class and form edges on each of her competitors. In additon to the three vital form factor edges you have to love the way she fits the condition like a glove. The conditions stipulate that a horse can't have two wins since oct 16 and she won on oct 15, she literally is eligible for this race by minutes. Chalk wins the first. For the last few weeks there has been almost a weekly announcement that some racing telecast on ESPN has been canceled. First it was the Kentucky Oaks and now it is the Preakness undercard. The summer races from Saratoga have migrated to MSG+, which is a regional sports channel and not a way to slowly terminate your mother in-law by Sesame Chicken. With coverage declining racing should stop trying to make juice with an unattainable seasonal fruit and make lemonade with the abundance of lemons it holds. TVG and HRTV both do fine work, they both present the races professionally and frankly better than ESPN has ever presented the races. The first thing I notice when I watch an ESPN racing broadcast are the camera angles. Racing is the rare broadcast subject where more is less. The explosive action of the thoroughbreds running is concentrated and explosive. One static camera angle will suffice to ensure that we are able to keep track of the action. ESPN usually has some MTV style/short attention span camera angle changes every five seconds. This type of camera work may work for pimple faced music videos watchers or for bored ball fans in need of mental masturbation. Knowledgeable race fans need a static shot so we can maintain constant knowledge of where our horses are in the pack. ESPN has consistently failed in this regard and has never acquired the basic knowledge on how to present racing. You finally a snag a glimpse of your deep closer making a move on the pan shot and then they jump to the head-on which is quickly followed by the blimp shot, by then you don't know who is who and what is happening. Another failure of ESPN in their presenting of horse racing is the neglect of the pretty pony crowd. Yes there are two very polarized groups that follow racing. The horse players and the pretty pony people. We have almost nothing in-common but the love of the horses and the love of the game. Both groups need to be catered to. Until ESPN started presenting racing I never realized how great of a job NBC did for the pretty pony people. NBC always had featured an underdog dramatic story and presented a tear jerker that pulled at a viewers heart strings. Maybe it was the influence of Bob Costos but NBC did a suburb job in this regard. ESPN has neglected these stories. Is it any wonder that the Nielson ratings for the Breeders Cup have crashed since ESPN took coverage in 2007? While Pretty pony People may be feeling neglected by ESPN coverage, horseplayers have some gripes too. Why has the national pick 4 been scrapped? That was a bet many fans looked forward to, in fact I still miss it and hope it is salvaged sometime soon. This was such an exciting wager, as it combined the appeal of four stakes races with live television coverage. It was a great bet to syndicate with your friends. For a modest investment a group could have a live ticket to destination scoreville. Anyone that has hit a large pick 4 knows that it is much more exciting than the long term fantasy games in vogue with ballfans. In addition to the excitement it provided, the pick 4 validated the TV coverage and provided a play along game that pulled viewers directly in to the action. It was truly a vital part of the coverage, an advertisement for the game of handicapping and it should be reintroduced ASAP. With the ESPN coverage being scrapped racing should value the two dedicated channels it already has in operation 365 days a year. The daily coverage provided by TVG and HRTV exceeds the quality of the rare ESPN stakes broadcasts. Before TVG was launched ten years ago racing was on TV for at most twelve hours a year, now it receives coverage 15 hours a day on two channels. This is a tremendous asset and one of the positive aspects of horse racing in America 2009. This positive aspect should be celebrated and invested in. Both of these channels are expert presenters of the game. If ESPN can not make a go of racing, let HRTV and TVG take over the stewardship of the media promotion efforts. Invest in these two channels and not coverage on Bravo, who are sure to be clueless on presenting racing If the two dedicated channels are lost it will takes years to recover the knowledge that these two channels hold. Maybe the Belmont train service can be salvaged? For me and other race fans it is a vital link from Manhattan to Belmont Park. The service still appears on the on-line MTA LIRR schedule. What a shame that the grandest urban racetrack in the US will have its dedicated train station shuttered due to budget cuts. While the government shuts off Belmont Park fans from public transit the same government is spending $91 million of taxpayer money to build a new Metro North Station for the New York Yankee baseball team. The Yankees already have a subway station but the local government felt it needed to spend $91 million of the taxpayers money so that the Yankees can have two stations. Yet another example of how government corruption has harmed horse racing in New York. Perhaps something is being worked on up in Albany and the Belmont train can continue to serve Belmont like it has for over 100 years. The lightly raced but heavily priced Dunkirk will have a stall in the derby if he is fit and able. With three horses ahead of him on the active graded stakes earnings list off the derby trail (Stardom Bound, Big Drama, Capt Candy Man Can) he sits at number 18 on the list(top 20 make it). The European win in your win entrant Mafaaz performed poorly at Keeneland so the Churchill European marketing attempt will not yield a starter this year. Square Eddie will start this week in the Lexington off a three month injury layoff and may be rushed into the derby. If Eddie defects that opens even more cushion to ensure that Dunkirk to get in. For procrastinators and the desperate there are two more opportunities for graded stakes earnings post Lexington; at Aqueduct there is The Withers GIII and the recently upgraded Derby Trial GIII at Churchill. The Withers will not produce a Derby entrant while the Derby Trial has produced a Derby entry every few years. 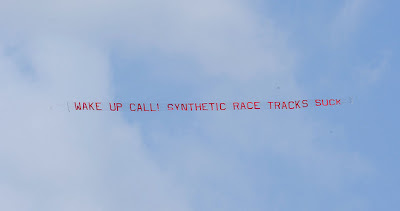 Some prankster out in California rented an airplane to tow this banner over Santa Anita. If there was any doubt how some people feel about synthetic tracks this makes it very clear. Being a horse racing fan was a tough haul this week. The twin stories being brutally beaten over and over have made their way to the mainstream. After a winter of nil publicity the game has made the TV news and the front page of the NY Times sports section. They say bad publicity is better than no publicity but the negative tone and the amount of the internet comments is overwhelmingly negative. The entire derby trail is being neglected this year while sensational tabloid journalism riddled with errors and misrepresentations is having an unprecedented run. The beating that Jeff Mullins is taking is the same beating that horse racing is about to take during the triple crown. It is unfortunate and deserved. If the same voices making a mountain out of the detention barn incident continue to sing their strident song for the mainstream media we could be looking at a banned sport in just a few years. The derby story lines are being buried and it seems like the buzz surrounding the derby will focus on the soiled name of Jeff Mullins. It is not enough that his horse was scratched from the Bay Shore, he has to be publicly humiliated and repeatedly flogged in blog after blog and article after article. He was wrong to do this in the security barn. Mullins will have his hearing and punishment will be doled out. The sensationalists must have their public stoning as they gather around and squeal in pleasure as stone after stone is applied. The reaction is outrageous and not based in reason. For them the application of an all-natural product sold in tack stores is proof that Mullins is a dirty cheater/pharmacist that has concoction after concoction of secret substances that make horses run at the front of the pack like machines. The fact that he has been winning horses racing since he was seventeen years old is not considered. Backstretch backstabbing may also be at work here. Reason and fairness have been scratched from the race alongside Gato Go Win. Condemnation of Mullins is not the end. After the condemnation of Mullins then comes the condemnation of racing period. There is an agenda at work here. The anonymous comments on these on-line articles referring to how most racehorses are routinely abused while they are in training is troubling. Yes these things do happen in isolated incidents but the game is being defiled as a activity filled with abuse and cruelty by people who have never been near a barn and surely have never mucked a stall. Racing has made tremendous strides to clean up the game. There is a stereotype that racing is a very dirty game and that the racetrack is a dirty place. Like many stereotypes there is some truth to the matter but the facts are being exaggerated to make the make the story fit into the anti-racing agenda. assumption is that you are a degenerate gambler through horse racing betting, disgustingly profane and a low-life. It is a ridiculous assumption but these stereotypes help simple people navigate the complex social landscapes where snap judgment decisions must be made with limited information. Simple people are applying the same stereotypes to Jeff Mullins. The way Mullins is being dragged through the mud is a foreshadowing of how the game will be dragged through the mud. Forces and agendas are building to remove horse racing from the American tapestry. The public beating that Mullins is bearing is the same beating that horse racing has been taking for many years. Isolated examples are blown out of proportion while the beauty and positive parts of the game, the hard work and love for the animals is completely ignored. Do you really think all of the horses in Mullins barn are abused and drugged to win races? Why is it that Michael Matz is the national spokesperson for Air Power yet his name has not been soiled in any of this? Is it because Mullins grew up riding at bush tracks and Matz is a high-class dressage legend? Does Mullins only employ only animal abusers? The almost unanimous condemnation against Mullins is beyond all reason and could only survive in the preposterous bleating of the flock of sheep against indoctrinated into shunning anything not politically correct. Many people want to see racing go away and those giving inordinate amounts of coverage to this sensational story are feeding the fires for the extremists like PETA who do not understand the complexities or appeal of horse racing. These people deal in half-truths , sound bites and sensationalism which has been produced by the lot this week. The articles appearing in the mainstream and extremist press are riddled with errors or poor information. If they can not get the minor details correct they are surely wrong on the big picture. The deluge of negative information from on-line racing sources and bloggers with good intentions are feeding the frenzy that will look to besmirch the game during the upcoming triple crown season. In this deluge of negative information there is but a trickle of attention on how this may be the best crop of three year olds to emerge in the decade. It is like good sense and perception have yielded to cheap attention and the sheep mentality. Few things in life are black or white, good or bad but Mullins almost universally denigrated all bad. He is like the Emmanuel Goldstein of racing, the boogieman that Big Brother uses so the masses have a target to direct their angst towards. The sensationalists have had a field day dragging out Mullins violation record. Yes there are offenses there but when we are dealing with the numbers of horses Mullins has in his care the numbers are skewed. While he is besmirched as a cheater most of the violations are for racing office violations like scratching a horse without permission or paperwork issues. There is a difference between cheating and the violations in Mullins record. Mullins has a green light on his head for abuse, he is one of the few people in racing that can openly be abused without consequence. Like Mullins horse racing is one of the sports that can be openly abused in the mainstream without consequence. A combination of success, working class background, frank talk to reporters and past offenses have landed Mullins squarely in the cross heirs of the sensationalists. Racing's use of animals for gambling have landed in the crossheirs of the politically correct and the animal rights extremists. Frank talk never gets you very far when talking to the masses and when Mullins called horseplayers idiots he displayed a lack of media savvy and tact. Sometimes frank talk like this is very helpful. The game has ridden itself of steroids due to the frankness of Rick Dutrow. America needs more frank talk and less smiling liars. America needs less sensationalism and more good racing. As discussed earlier this week Papa Clem is a colt I am anxious to play in the Arkansas derby. First time on dirt Friesan Fire blow his doors off on a sloppy track but he held gamely for place. Don't let the win margin in a slop race fool you, they frequently are won by 10 or more lengths providing a visual illusion of superiority for the winner. Papa Clem ran a nice race in defeat. It looks like the trainer has had Papa at Oaklawn for the last three weeks and he has been working up a storm. He draws a nice inside post for his run style and 2nd time dirt should move him up. If there is any type of inside speed bias Papa is the horse that will benefit the most. I like this horse quite a bit at 6-1 and will play him to win, if Old Fashioned decides to rate it is lights out and the others will not catch Papa Clem. With less than four weeks to the Kentucky Derby bettors are solidifying opinions. It is becoming more and more clear that I Want Revenge is going to be the clear favorite as we move closer to the race. As more people watch the Wood and listen to Durkin's hysterics I Want Revenge is going to start to build hype. The current Kentucky Derby betting has I Want Revenge listed at 7-2. With the second choice Quality Road not able to train due to a quarter crack it seems like I Want Revenge has opened up daylight on his competition. Quality Road is questionable just to be in the gate, 5-1 on him to win the 2009 Kentucky Derby is a sucker bet. The co-third choice is the lightly raced Dunkirk at 6-1 who was easily turned back by Quality Road. Dunkirk lacks seasoning and is another who is questionable to be in the gate due to a lack of earnings. With new defections showing up by the day Dunkirk does figure to sneak in the race. The other third choice is Friesen Fire who won the Louisiana Derby by a pole, but that was on slop which typically produces disingenuous win margins. Freisen Fire's seven week gap in races is bewildering to me so 6-1 does not interest me at all. The fifth choice at 7-1 is Pioneer Of The Nile who is a turf horse. Without synthetic surfaces this horses would not even be on this list. 7-1 on the Zayat stable runner is another sucker bet. Out of all the short price type horses I Want Revenge Stands Tall, 7-2 is not a bad proposition and you will surely be looking at a shorter price on derby day. At the other end of the odds spectrum an intriguing longshot is Papa Clem. This colt was stuck out in Wally Wubber World California where his first four races were on all-weather surfaces. He ran very gamely in California and displayed a run style that may translate better to a dirt surface. Papa Clem took his shot on dirt in the sloppy Louisiana Derby and ran okay first time while on a completely foreign surface. He will run in the Arkansas Derby and I suspect he will give a good account of himself there. If you want to grab some value the current 40-1 on Papa Clem is appetizing. His price may drop dramatically after Saturday if he wins or places like I suspect at Oaklawn. Yet another great day at the Big-A. While others choose to waste hundreds of dollars to go to taxpayer park A & B($1.8 Billion in public debt)the smart discretionary money was at the Big-A. Free to admission, free parking and free to scream your lungs off. The weather was a brisk 55F and the forecast winds gusting to 35 knots out of the southwest were blocked by the massive grandstand. The track was very fair to closers and speed, so perhaps Todd Pletcher must be kicking himself for not entering Dunkirk in the Wood who likely could have given a favorable account of himself on a fair surface. The crowd was boisterous at the Big-A. There were random chats of Tala-mo throughout the day from the third floor grandstand. One side of the grandstand would randomly and loudly chant "tala!" and the other side would return chant "mo!". This went on for most of the day and foreshadowed the Wood heroics. No PA system required to tell the fans what to do as the life was bubbling out of them, no PA system puppet strings required. For a modest sized crowd it was loud and the stakes winners all received rounds of applause when they returned to be unsaddled. It was sort of like a mini-Belmont Stakes day in an edgy environment. It was was a very interesting card and the track was fair with speed, stalkers or closers all claiming wins on the day. Almost every year a obscene longshot wins one of the undercard races (2005 Livelyupyourself 48-1, etc etc) and this year that tradition was upheld by All Bets Off at 20-1 in race 2. Race 6 winner Montecore is a horse to watch as he won with complete ease. The winner of the Bay Shore Capt Candyman Can looked tremendous in the paddock and ran to his looks. Giant Moon continued his successful return to the races with improving form third off the layoff. He claimed the Excelsior Handicap while pressing a slow pace, his 13-1 price spiced up the exotic vertical wagers surrounding the Wood Memorial. A game Kodiak Kowboy gallantly ran down Fabulous Strike to annex the Grade I Carter, making it graded stakes wins at all three NYRA tracks and wins in over the last three seasons. The Wood Memorial was touted as I Want Revenge and Imperial Council versus the rest. Only these two were bet with the rest of the horses cold on the board. After looking closer at the race I picked up a few solid knocks on Imperial Council. A generous poster on paceadvanatge.com pointed out that Imperial Council's action was paddle wheel-like. After watching a few head-on replays of Imperial Council's races I agreed, horses with inefficient action tire going long. Imperial Council was a power toss. When Imperial Council made a complete mess of the paddock I felt confident that he would be off the board and I was able to really get involved in the horizontal wagers. With two power opinions in the Wood, (I Want Revenge was a lock / Imperial Council would be off the board) I was able to obliterate the race vertically and horizontally. (sorry for the redboard) Imperial Council's future is in running at sprint distances. His inefficient action will keep him at distances less than 8 furlongs. As Soon as Shug figures this out the better. For my sake I hope he runs long all year. As anyone can see I Want Revenge was very impressive. He had to overcome breaking five lengths behind the field, running into a trap, running in to a jackpot, he got knocked sideways and had to split horses on two occasions. Even with all these obstacles blocking his access tot he wire he won clear as much the best. I Want Revenge's Wood trip is so eventful that you have to wonder if it took something out of him. My gut says he will be okay. Previous class horses to have nightmares trips like this were Invasor in the 2007 Donn, and Alfeet Alex in the 2005 Derby and Preakness. Both horses came back to win their next starts. Class horses and class people thrive on adversity. King Puma comes into this race the right way, third off the layoff and off two poly races. Today is the day where he can sit back and make his run without having to get involved too much early. We know that he loves dirt and he won at 6 1/2 so the 7 furlongs should be good for him. We have positive form, his pace fits right in, now he has to answer the class question. At 12-1 morning line it should be a question that you are willing to answer. With only three starts on his record there are legions of people arguing that Churchill should do something to ensure horses like Dunkirk can have access to the Kentucky Derby starting gate. These people are flat out wrong, one hit wonders like Dunkirk should be excluded from the Derby if they do not have the requisite graded earnings, the conditioning or the record of success. Racing needs horses to race, not stay in the barn. Dunkirk and his possible exclusion from the derby is often linked to Mafaaz. Mafaaz won the Kempton challenge and while he looks overmatched in the derby some argue and he will exclude a live contender. Another frequent complaint is the pair of Godolphin horses who will likely enter the Kentucky derby who won their owners money in Dubai. This international presence in America's most famous race is great for the game. Horses like Mafaaz, Desert Party and Regal Ransom provide intrigue and provide access to overseas growth markets. Horses like Dunkirk with their lack of races and injury prone nature are a cancer on the game. One of the chief things that plagues racing is horses like Dunkirk. We have graded stakes horses that do not race, they stay in the barn and only come out for an afternoon run once in a while when they are in absolutely pristine form. This is terrible for the game and robs the game of intrigue and the ability to follow horses. Those in charge should do nothing to accommodate horses that face the consequences of a lack of racing. Typically a horse can stay in the barn with complete impunity. The Kentucky Derby is one the rare situations where a horse like Dunkirk's connections are punished for the lack of racing, let the punishment stand if it holds. Look at horses like Ghostzapper from 2004 and his brilliant four race campaign. Ghostzapper did nothing in the afternoon from September 2003 to July 2004 and then raced every 6 weeks or so in short fields up until his breeders cup classic win at Lone Star. While he may of been brilliant in those four races it was not exactly conducive to building a sports fan base. Four race campaigns disengage the public from big time stakes races and should be discouraged whenever possible. The graded stakes earning list for the derby is one of those few instances. Who can forget Easy Goer's 1989 three year old campaign? 11 races, 3 wins over older routers in a grade I and a total of 8 graded wins. Despite his extraordinary season Easy Goer lost the BC classic to a horse that was laid up for most of the summer while Easy Goer won Grade I after Grade I. Ever since that race of decade in the 89' BC classic horses have been managed more judiciously, races leading up to the breeders cup have been shortened and horses have followed the example of Sunday Silence taking the summer off rather than the complete campaign of Easy Goer. While it may be good for the connections to pick conservative spots like this, it is terrible for the game. While the Kempton challenge could be considered a gimmick, it is an attempt to build interest in the Kentucky Derby. There is a huge untapped international market and the presence of this one horse could do wonders for increasing the interest in the derby and American racing in general. People in London bookie shops will have a greater interest in the Kentucky Derby and maybe even American casual fans will be intrigued by a foreign dark horse. The masses need big and easy story lines to follow, something that they can grab and run with. Will Mafaaz keep out Dunkirk? I don't think he will but if he does it will send the message that your big horses need to race. A horse like Dunkirk if he was to succeed in the derby would set a precedent where many trainers would try to go into the triple crown off of one prep race. Look at the success of the ill fated Barbaro. At the time going into the derby on five weeks rest was taboo, but Barbaro's success has emboldened trainers like Larry Jones to take Friesian Fire off a 7 week rest into the derby this year. A derby success by Dunkirk would lead to a copy-cat horses in later years that race with even less bottom conditioning. What happens to horses with a lack of a bottom? They get injured and they are whisked away as soon as we begin to admire them. The current system of graded stakes earnings favors horses that have been racing and earning over a period of time. This is a solid system. It is not a perfect system and surely anomalies like the $1 million Delta Jackpot Skew the graded earnings list but at least horses that race are favored and not one hit wonders. Some mark the first day of spring as the vernal equinox, looking up that high gives me a pain in the neck. For me and other passionate race fans from New York we mark the beginning of spring as the return of Tom Durkin to Aqueduct. It has been so good to hear him today at Aqueduct. His calls are crisp and filled with emotive adjectives. Racing is great all alone but season it with a bit of Tom Durkin and it becomes extraordinary entertainment.